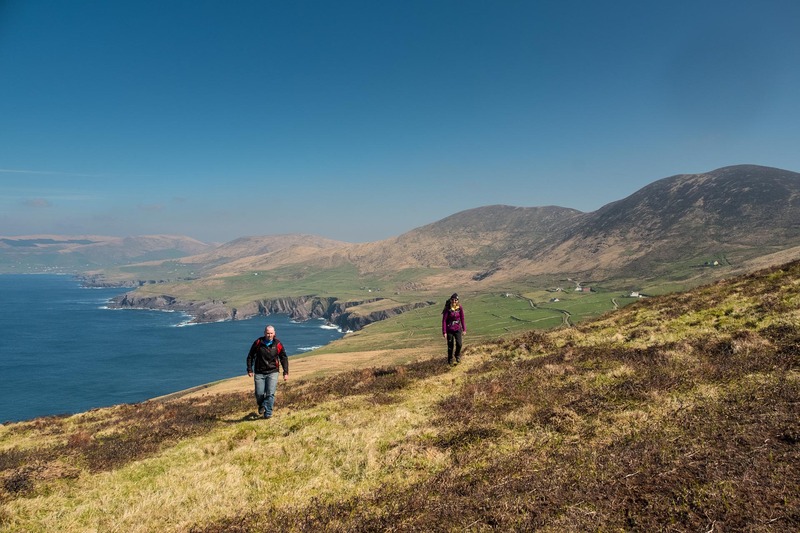 Two head Loop walks in South Kerry, Bolus and Bray head. 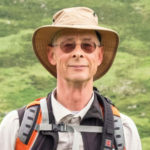 We wanted to check out some walking in the Ballinskelligs-Valentia area for one of our Wild Atlantic Walking Tours German clients, and did this last Saturday, a day starting out really cold, turned sunny and warm, but with a stiff breeze blowing all day. It turned out a different day with breakfast at Barbara’s Cafe Cois Trá, lunch at the Moorings in Portmagee between both walks, finishing of at the Point Seafood Bar, at the Cahirciveen side of the Valentia Ferry crossing. Both walks are Loop walks, with Signal towers from Napoleon times on each one. 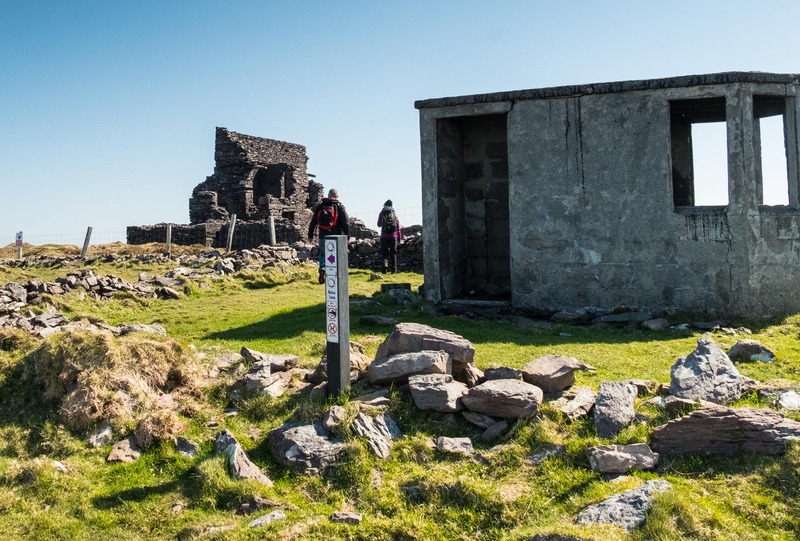 The Bolus head walk is 2,5 hours long and more strenuous; Bray head 1,5 hour with an easy in and out path, or the loop option via the higher cliff. 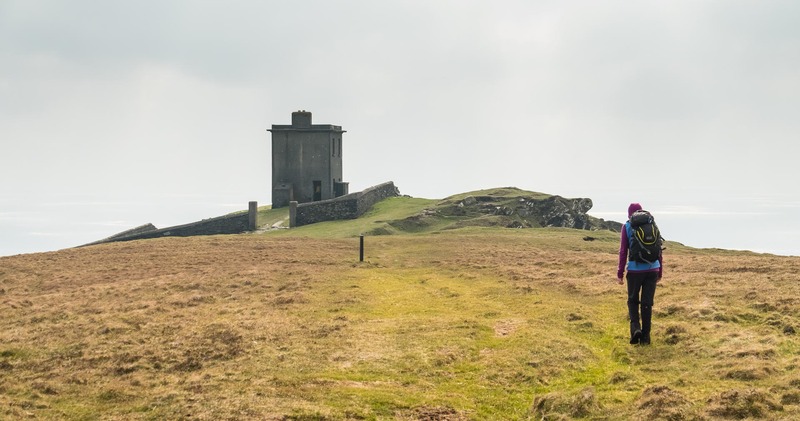 Bolus head Signal tower is more extensive, and outside it there is a 2nd WW lookout post, used to keep a lookout on German U boats and allied shipping, passing by the neutral Irish coastline. 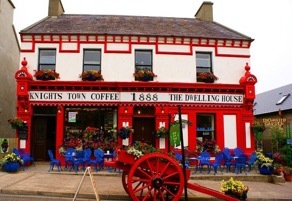 We left Kenmare early and had a toasted sandwich breakfast at Barbara’s Cafe Cois Trá at Ballinskelligs beach, full of historical photos and copies of local history books. Then we went down to the shore and McCarthy Mor Tower House, built in the 16th century to protect against pirate attacks, and went on to explore Ballinskelligs Abbey, founded for monks who came to the mainland from Skellig Michael in the 12th Century after numerous attacks by Vikings. The Priory was dedicated to St. Michael, as was Skellig Michael, and the monks adopted the Augustinian rule. We then met a blow-in local, Greg McNamara, musician, sound recording engineer, and runner., who lives with his partner photographer Madeline Weber down the road. We drove to Bolus head and parked at the Air memorial, the monument to the American Liberator, which crashed off the Skelligs in 1944, below it is the small Doongar promontory fort. Starting the Bolus head loop walk, follow the narrow road around to the right. 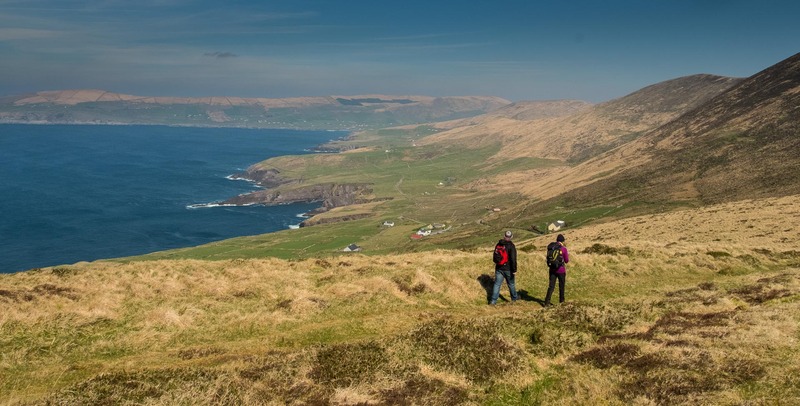 It follows the coast with spectacular views over Puffin Island, and then the Skelligs further to the left; with gannets diving in all over Saint Finans Bay. On top, we had a good look at the Signal tower with its walled outside area is quite extensive, and outside it there is a 2nd WW lookout post, used to keep a lookout on German U boats and allied shipping, passing by the neutral Irish coastline. 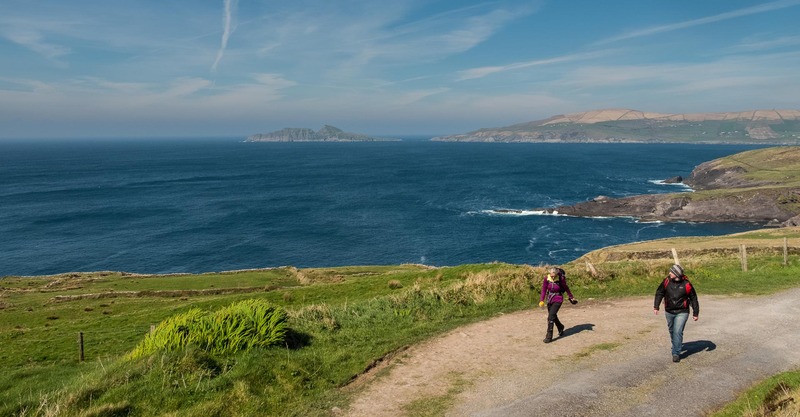 After this walk, we had lunch in Portmagee at the Moorings and Bridge bar, next to the bridge to Valentia Island, and the point where the boats leave for the “Star Wars” Skellig Michael. Afterwards we drove over the bridge turning right for the well signposted the Bray head walk on Valentia Island; very busy with locals and tourist walking the lower in and out path, while we went around the right-hand side higher loop via the cliffs, and looking down on the square Signal tower, and the narrow point of Bray head. After these walks, windburned and well exercised, we drove down to Knights town, but we were too late for cake and tea at the beautiful coffee and bookshop, so we took the ferry to The Point Seafood Bar on the other side, looked for tea and cake there, the answer was, no Cake but lots of great Hake!! We enjoyed the tea and chocolate bars. We chose to drive home from Cahirciveen to Kenmare via Bealach Oisin, and got this beautiful evening view of the MacGillicuddy’s Reeks and nearly full moon. What a day! 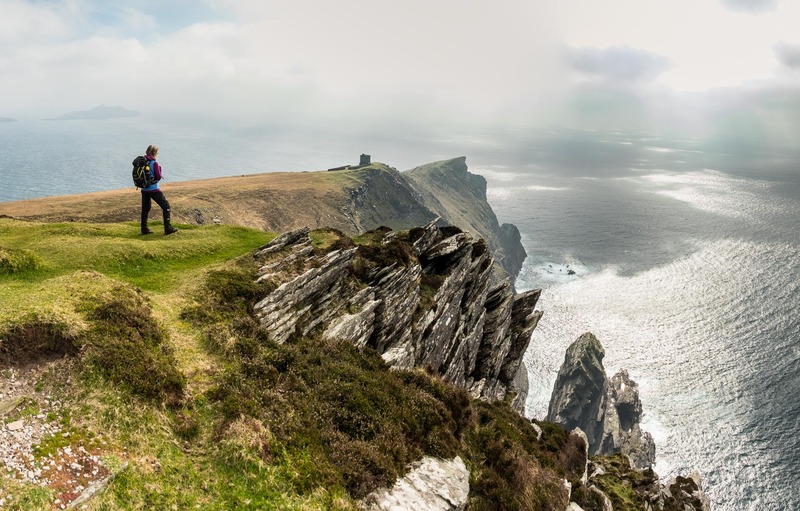 Wild Atlantic Walking Tours provide a variety of walks to suit all grades, with respected local guides.